Ready to run your first trail race? 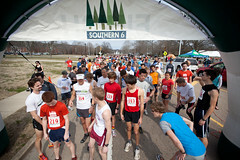 Try trail running with the Southern 6! First things first: I am not a runner. Well, okay, these days it’s getting harder and harder to say that; I ran my first trail race yesterday and I keep finding more and more time in my evening schedule for running. However, I’ve never been a runner. I didn’t run track or cross country in high school or college, I’ve never run consistently in my life, and this whole thing is brand new for me. Hey, every ultra runner starts with that first 5k, fun run, or jog around the block …right? This year’s Salomon Rock/Creek Trail Series is going to be bigger and better than ever, especially with the new Still Hollow Half Marathon (details TBA) at Enterprise South Nature Park replacing the Greenway 5-mile trail race. But a large part of our mission is growing the sport of trail running, and we think it’s super important to give beginner trail runners the opportunity to participate. That’s why, every year, our series begins with a short, fun, family-friendly 6k. It’s also why we offer shorter distance options for nearly all of the Salomon Rock/Creek Trail Series races: 6.5 miles for the Rock/Creek River Gorge trail race, a half-marathon distance for the Scenic City Trail Marathon, 10k for the Still Hollow Trail Race, 11 miles for the Rock/Creek StumpJump 50k and another 10k for the Lookout Mountain 50-mile Trail Race. We want everyone to be able to enjoy running on trails; some will start out running 10k races and end up running 50k races, and some won’t, and we think that’s just fine! Maybe you’ve run a 5k on roads but have never set foot on trail. Maybe you’re already a long-distance trail runner, and you’re here with a friend or family member who wants to give it a try. Maybe you’re a long-time hiker who wants to see more miles in less time. Maybe you just want to get in shape, but think roads are for cars and can’t stand the treadmill. Maybe you just want to support the continued growth and maintenance of our local trail systems, and are willing to gallop around in the woods in order to do so! Whatever your story, the Salomon Rock/Creek Trail Series has races for you to participate in. The Southern 6(k) is a great place to start, just under 4 miles on a beautiful course at Southern Adventist University’s campus in Collegedale. If you’re thinking of running the race but have questions — whether they’re about trail footwear or how to dress or what the course is like or race specifics — visit the Southern 6 Facebook page and ask away. Of course, if you’re thinking of running, we recommend you take the plunge and sign up now. There’s no time like the present! For inspiration, check out these photos from last year’s race, or watch the video below. Like us on Facebook to win VIP tickets to Stacy Allison’s “Beyond the Limits” event!